The english partner book of the german »Commons – Für eine neue Politik jenseits von Markt und Staat« has been released! The book was edited by David Bollier and Silke Helfrich. 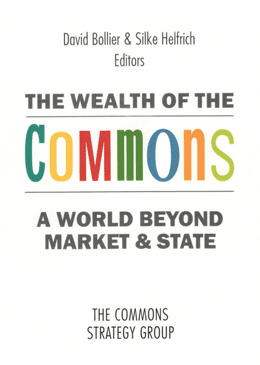 I like the english title which is »The Wealth of the Commons: A World Beyond Market and State« focussing on the new world to be created and not primarily on new politics to be made. However, this is only a personal remark. I am happy that Christian Siefkes‘ and my contributions are part of the german as well as of the english book, and I think we will republish our english articles here. The articles of both books are not identical, the editors arranged some different mixtures depending on the german and english speaking audience. Both books are definitely worthwhile to read. The book content was released under CC-by-sa license and can be downloaded (stepwise) or bought. It has become increasingly clear that we are poised between an old world that no longer works and a new one struggling to be born. Surrounded by an archaic order of centralized hierarchies on the one hand and predatory markets on the other, presided over by a state committed to planet-destroying economic growth, people around the world are searching for alternatives. That is the message of various social conflicts all over the world—of the Spanish Indignados and the Occupy movement, and of countless social innovators on the Internet. People want to emancipate themselves not just from poverty and shrinking opportunities, but from governance systems that do not allow them meaningful voice and responsibility. This book is about how we can find the new paths to navigate this transition. It is about our future. But since there is no path forward, we must make the path. This book therefore is about some of the most promising new paths now being developed. Its seventy-three essays describe the enormous potential of the commons in conceptualizing and building a better future. The pieces, written by authors from thirty countries, fall into three general categories—those that offer a penetrating critique the existing, increasingly dysfunctional market/state partnership; those that enlarge our theoretical understandings of the commons as a way to change the world; and those that describe innovative working projects that are demonstrating the feasibility and appeal of the commons. David Bollier (USA) is an author, activist and independent scholar of the commons. He is Co-Founder of the Commons Strategies Group and the author of ten books, including Viral Spiral, Brand Name Bullies and Silent Theft. He lives in Amherst, Massachusetts and blogs at www.Bollier.org. Read more about the book in this article. Silke Helfrich (Germany), is an author and independent activist of the commons. She is a founding member of Commons Strategies Group. She was regional representative of the Heinrich Böell Foundation in Mexico/Central America for several years, and was the editor of Wem gehört die Welt, and translator and editor of Elinor Ostrom: Was mehr wird, wenn wir teilen. She blogs at www.commonsblog.de.